<h2>Ebola outbreak – this time it’s different</h2><br /><p>A new Ebola epidemic in the DRC has killed at least 28 people since April but a&nbsp;<a href="http://apps.who.int/iris/bitstream/handle/10665/272859/SITREP_EVD_DRC_20180619-eng.pdf?ua=1" target="_blank" rel="noopener noreferrer">situation report</a> from the World Health Organization (WHO) on 19 June says they are monitoring the outbreak with cautious optimism.&nbsp;</p> <p>The&nbsp;contrast with the 2013-16 outbreak in West Africa is stark. That epidemic killed more than 11,000 people and prompted criticism of local and global health organisations for taking too long to get the outbreak under control.</p> <p>This time, when Ebola struck, the world was better prepared. Over the past two years, networks of researchers and health workers have been established, lab infrastructure has been built up, and vaccines have been fast-tracked through research and development and the regulatory system, helped by a global network of funders in preparedness research called GloPID-R.</p> <p>However, the&nbsp;danger has not yet passed. Just a week earlier, when visiting Kinshasa, capital of the DRC, on 12 June, WHO Director General, Tedros Adhanom Ghebreyesus, said: ‘Even if one case … gets to an urban area, that could trigger another epidemic.’</p> <p>The big fear is that the virus could reach Kinshasa – home to around 10 million people – or the nearby city of Brazzaville in the neighbouring Republic of Congo. These populous cities would give the virus an opportunity to quickly infect large numbers of people and to spread through transport networks to other parts of Africa. Experts who have traced <a href="https://horizon-magazine.eu/article/virus-hunters-tracking-down-next-pandemic_en.html" target="_blank" rel="noopener noreferrer">the spread of HIV in the 20<sup>th</sup></a> century found that Kinshasa’s railways played a key role in the explosive spread of the disease.</p> <p>The previous West African epidemic prompted much soul-searching among global health figures and the research community. This spurred renewed investment in networks of scientists tasked with preparing the region for future outbreaks of Ebola and other infectious diseases. Not only have research teams been developing the vaccines, tests and treatments needed to curb the spread of disease, they are a standing army of experts ready to react when a crisis breaks.</p> <p>For the newly established PANDORA network, their first crisis came earlier than expected. ‘We formally launched our consortium on 8 May – the day the Ebola outbreak in DRC was officially declared to be an epidemic,’ recalled Professor Francine Ntoumi from the Fondation Congolaise pour la Recherche Médicale, Republic of Congo, who jointly leads PANDORA.</p> <p><strong>Baptism of fire</strong></p> <p>It was a baptism of fire, but showed the value of mobilising networks in an emergency. ‘The Ebola outbreak is near the border of the DRC and Republic of Congo. We immediately organised in the DRC and engaged with our contacts in the Republic of Congo, including ethics committees and regulatory authorities,’ she said.</p> <p>The goal was to secure swift approval for the steps to take in managing Ebola cases and to mobilise the funds needed to train health professionals. A workshop attracted experts from both sides of the Congo River, as well as from Gabon, Cameroon and the Central African Republic. Healthcare workers were trained in the use of new diagnostic tests and infection control measures – essential skills if the virus spreads to neighbouring countries.</p> <p>After the current epidemic has passed, the EU-funded network will continue its work, collecting data on human and animal health, building capacity in laboratories and health systems, and further expanding the availability of diagnostic tools. For Professor Ntoumi, this is a radical shift from the fire-fighting approach of the past.</p> <p>‘When there is a fire, international agencies come to help – then they go,’ she said. ‘But if local people are not trained in how to stop the next fire, there will be another crisis. I see our network as a way to stop fires from developing in the first place. It’s a long-term, more sustainable solution.’</p> <p>Europe has set up its own network of clinical research sites, primary care clinics and hospitals to prepare for new and re-emerging health threats. PREPARE was launched in 2014 and connects more than 1,000 sites across the EU.</p> <p>Now a new network – the African coalition for Epidemic Research, Response and Training (ALERRT) – aims to build on this model for sub-Saharan Africa. Professor Peter Horby, from the UK’s Oxford University, a member of PREPARE and coordinator of ALERRT, said the challenges facing Europe and Africa are significantly different.</p> <p> <div class="quote-view quotesBlock quote_horizontal"> <div class="quotesTop"><img src="https://horizon-magazine.eu/sites/all/themes/horizon/images/quotes_top.png" alt="" title="" /></div> <p>'It’s almost impossible to start a trial from scratch during an outbreak. '</p> <blockquote><p>Professor Peter Horby, Oxford University, UK</p></blockquote> <div class="quotesBottom"><img src="https://horizon-magazine.eu/sites/all/themes/horizon/images/quotes_bottom.png" alt="" title="" /></div> </div> </p> <p>‘The difference is quite stark in terms of the outbreak frequency that we will face in ALERRT,’ he said. ‘The PREPARE network has helped to ready Europe for future outbreaks but has yet to face a major epidemic crisis. In contrast, ALERRT was launched last December and, before we held our kick-off meeting in March, we had outbreaks to deal with.’</p> <p><strong>Plague</strong></p> <p>The first was an epidemic of plague in Madagascar, followed closely by a Lassa fever outbreak in Nigeria, and then Ebola in DRC. ‘Sub-Saharan Africa is always in outbreak mode,’ Prof Horby said. ‘This brings different challenges but ensures the motivation of clinicians, officials and regional partners is always strong.’</p> <p>Research facilities and capabilities in many parts of Africa are less developed than in Europe. One of the consortium’s first tasks is to establish a clinical research network, build data management infrastructure, and get scientists working together.</p> <p>In the past, clinical research was seen as luxury but is now viewed as a core pillar of outbreak response plans. This supports the control of current outbreaks and improves preparedness for the next.</p> <p>‘It’s now accepted that we need people in place with the tools and skills to respond quickly,’ said Prof Horby. ‘It’s almost impossible to start a trial from scratch during an outbreak, you need to have protocols, ethical approvals and logistics in place in advance.’</p> <p>The ALERRT network will be ready to respond to any infectious disease threat. ‘It’s not just about Ebola – we have to avoid falling into the trap of being prepared for the last outbreak. We need to be ready for anything.’</p> <p> <div class="moreInfoBlock"> <h3>Fast-tracking Ebola research</h3> <p>The 2013-16 Ebola outbreak was a wake-up call for global health research. 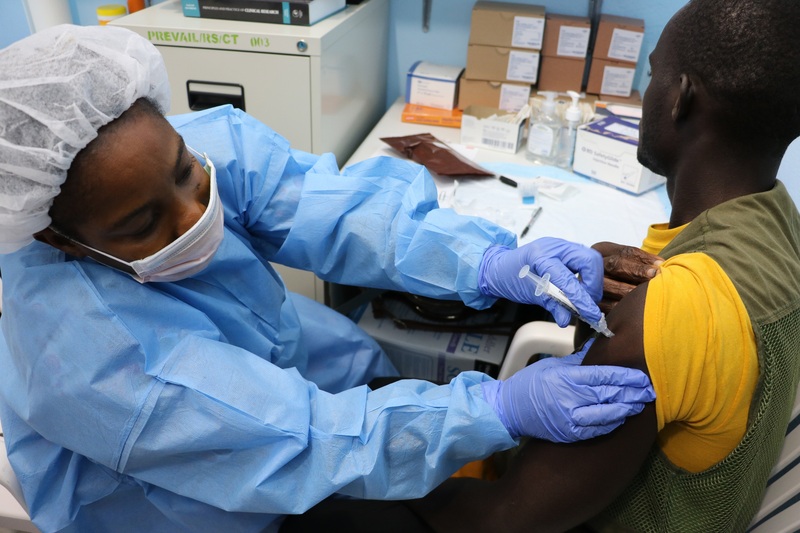 While several vaccines against the deadly disease were in the early stages of clinical development, there had been little urgency until the West African epidemic.</p> <p>Getting vaccines through clinical trials can, in ordinary times, take years, so the EU’s Innovative Medicines Initiative&nbsp;helped to bring together companies, academics and regulators in public-private partnerships to advance research on several vaccine candidates.</p> <p>Testing Ebola vaccines is tricky, as outbreaks are unpredictable and it is unethical to expose human volunteers to the virus, so to speed up the process, regulators decided to allow companies to combine safety data from humans with effectiveness tests on animals.</p> <p>Paul Stoffels, chief scientific officer of Johnson &amp; Johnson (J&amp;J), which has developed an Ebola vaccine that has been trialled in 5,000 volunteers since the last outbreak, said this was vital. ‘Thanks to significant support from regulators, we have produced&nbsp;2 million vaccines and have gathered data on safety, tolerability and durability of response.’</p> <p>These 2 million doses are stockpiled and available for deployment in DRC should it be requested by WHO and the national health authorities. The main advantages of the J&amp;J vaccine are that it protects against several different Ebola strains, and that it does not need extreme cold chain for its transportation and use. Other solutions coming out of the collaboration include iris scans that provide a no-touch way to to identify an individual, and so facilitate vaccine studies and vaccination campaigns in areas where records are sparse.</p> <p>Stoffels says this kind of preparatory work has paid dividends. ‘With this outbreak, patients have been diagnosed and isolated very early on, and vaccines were deployed to stop the spread. It is a dangerous situation, but research has helped put us in a better position than ever before,’ he said. &nbsp;</p> </div> </p> <p><em>The research in this article was funded by the EU. If you liked this article, please consider sharing it on social media.</em></p> <p><a href="http://bit.ly/newsalertsignup" target="_blank" rel="noopener noreferrer"><img src="https://horizon-magazine.eu/sites/default/files/news-alert-final.jpg" alt="" width="983" height="222" /></a></p> <br /> <img src=”http://www.google-analytics.com/collect?v=1&tid=UA-40077089-1&cid=ebola-outbreak-–-this-time-it’s-different&t=event&ec=republish&ea=read&el=ebola-outbreak-–-this-time-it’s-different&cs=republish&cm=republish&cn=republish&cm1=1" /> This post <a href="https://horizon-magazine.eu/article/ebola-outbreak-time-it-s-different.html">Ebola outbreak – this time it’s different</a> was originally published on <a href="https://horizon-magazine.eu/">Horizon: the EU Research &amp; Innovation magazine | European Commission</a>. A new Ebola epidemic in the DRC has killed at least 28 people since April but a situation report from the World Health Organization (WHO) on 19 June says they are monitoring the outbreak with cautious optimism. The contrast with the 2013-16 outbreak in West Africa is stark. That epidemic killed more than 11,000 people and prompted criticism of local and global health organisations for taking too long to get the outbreak under control. This time, when Ebola struck, the world was better prepared. Over the past two years, networks of researchers and health workers have been established, lab infrastructure has been built up, and vaccines have been fast-tracked through research and development and the regulatory system, helped by a global network of funders in preparedness research called GloPID-R. The big fear is that the virus could reach Kinshasa – home to around 10 million people – or the nearby city of Brazzaville in the neighbouring Republic of Congo. These populous cities would give the virus an opportunity to quickly infect large numbers of people and to spread through transport networks to other parts of Africa. Experts who have traced the spread of HIV in the 20th century found that Kinshasa’s railways played a key role in the explosive spread of the disease. For the newly established PANDORA network, their first crisis came earlier than expected. ‘We formally launched our consortium on 8 May – the day the Ebola outbreak in DRC was officially declared to be an epidemic,’ recalled Professor Francine Ntoumi from the Fondation Congolaise pour la Recherche Médicale, Republic of Congo, who jointly leads PANDORA. It was a baptism of fire, but showed the value of mobilising networks in an emergency. ‘The Ebola outbreak is near the border of the DRC and Republic of Congo. We immediately organised in the DRC and engaged with our contacts in the Republic of Congo, including ethics committees and regulatory authorities,’ she said. The goal was to secure swift approval for the steps to take in managing Ebola cases and to mobilise the funds needed to train health professionals. A workshop attracted experts from both sides of the Congo River, as well as from Gabon, Cameroon and the Central African Republic. Healthcare workers were trained in the use of new diagnostic tests and infection control measures – essential skills if the virus spreads to neighbouring countries. After the current epidemic has passed, the EU-funded network will continue its work, collecting data on human and animal health, building capacity in laboratories and health systems, and further expanding the availability of diagnostic tools. For Professor Ntoumi, this is a radical shift from the fire-fighting approach of the past. Europe has set up its own network of clinical research sites, primary care clinics and hospitals to prepare for new and re-emerging health threats. PREPARE was launched in 2014 and connects more than 1,000 sites across the EU. Now a new network – the African coalition for Epidemic Research, Response and Training (ALERRT) – aims to build on this model for sub-Saharan Africa. Professor Peter Horby, from the UK’s Oxford University, a member of PREPARE and coordinator of ALERRT, said the challenges facing Europe and Africa are significantly different. Research facilities and capabilities in many parts of Africa are less developed than in Europe. One of the consortium’s first tasks is to establish a clinical research network, build data management infrastructure, and get scientists working together. In the past, clinical research was seen as luxury but is now viewed as a core pillar of outbreak response plans. This supports the control of current outbreaks and improves preparedness for the next. The 2013-16 Ebola outbreak was a wake-up call for global health research. While several vaccines against the deadly disease were in the early stages of clinical development, there had been little urgency until the West African epidemic. Getting vaccines through clinical trials can, in ordinary times, take years, so the EU’s Innovative Medicines Initiative helped to bring together companies, academics and regulators in public-private partnerships to advance research on several vaccine candidates. Testing Ebola vaccines is tricky, as outbreaks are unpredictable and it is unethical to expose human volunteers to the virus, so to speed up the process, regulators decided to allow companies to combine safety data from humans with effectiveness tests on animals. These 2 million doses are stockpiled and available for deployment in DRC should it be requested by WHO and the national health authorities. The main advantages of the J&J vaccine are that it protects against several different Ebola strains, and that it does not need extreme cold chain for its transportation and use. Other solutions coming out of the collaboration include iris scans that provide a no-touch way to to identify an individual, and so facilitate vaccine studies and vaccination campaigns in areas where records are sparse. Stoffels says this kind of preparatory work has paid dividends. ‘With this outbreak, patients have been diagnosed and isolated very early on, and vaccines were deployed to stop the spread. It is a dangerous situation, but research has helped put us in a better position than ever before,’ he said.